Wonderland is 30 miles outside Toronto. Located just 30 minutes from Toronto, Ontario, Canada's Wonderland provides 330 acres of theme park fun for all ages. Canada's Wonderland was first proposed in 1972 by the Taft Broadcasting Company. 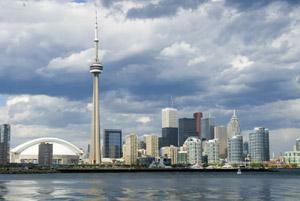 Among the possible sites was the greater Toronto area, Cambridge, Milton or Niagara Falls. Maple was selected due to its proximity to Toronto and the major highways. While the park construction was opposed by area cultural institutions, it finally opened to the public on May 23, 1981. Wonderland was owned by Paramount Pictures from 1994 to 2006, when it was known as Paramount Canada's Wonderland. In 2006, the park was sold to Cedar Fair Entertainment Company and returned to its original name. During 2005 and 2006, Wonderland was the most attended seasonal theme park in North America. Eight themed areas that surround Wonder Mountain at the center of the park. Behemoth: This hypercoaster will open to park visitors in 2008. Behemoth lives up to its name - when it opens, it will be Canada' fastest, tallest roller coaster. Riders climb 230 feet, then plunge down an 85 degree drop before taking off through high speed twists, turns and loops, reaching speeds of 125 kilometers per hour. Drop Zone: Riders take a vertical lift 23 stories up a tower, only to be dropped at 100 kilometers an hour. [[Top Gun Roller Coaster | Top Gun: This inverted roller coaster simulates the thrills of the hit film, reaching speeds of 90 kilometers per hour. Vortex: Canada's first suspended roller coaster is sure to get riders screaming as it travels over Wonder Mountain. Sky Rider is one of the thrilling coasters. The Bat: This corkscrew roller coaster gives riders a jolt - just when it seems the ride is through, it goes for a second round - backwards! 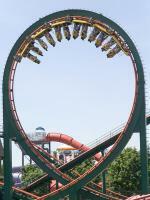 Dragon Fire: This double looping roller coaster includes a side-winding helix and a thrilling corkscrew. Thunder Run: Climb aboard this runaway coaster that travels through Wonder Mountain. Mighty Canadian Minebuster: Canada's largest and longest wooden coaster never falls short of delivering excitement. Tomb Raider: The Ride: This roller coaster delivers a unique riding experience, allowing guests to "fly" along the track. Scooby's Gasping Ghoster Coaster: A fun-filled children's coaster that delivers pint-sized thrills. Hanna-Barbera Land: This fun-filled area of the park features Hanna-Barbera characters in rides such as Scooby Doo's Haunted Mansion. KidZville: Kids won't run out of fun things to do in this area, including the Taxi Jam family roller coaster, Chopper Chase helicopters, and Silver Streak, a junior inverted coaster. Nickelodeon Central: Nickelodeon characters are featured in this children's area, including Dora the Explorer, Jimmy Neutron, and SpongeBob SquarePants. Splash Works: The water park area includes Canada's largest outdoor wave pool, 16 water slides, and a lazy river. Wonderland also features carousels, bumper cars, and a variety of carnival style rides, as well as Action FX Theatre featuring SpongeBob SquarePants in 3D. Canada's Wonderland added the Kingswood Music Theatre in 1983, a 15,000 seat amphitheatre that hosts a variety of headliners. Additionally, theatres throughout the park offer shows such as the "Endless Summer" ice show, "Twisting to the 60s" musical revue, and "Dora's Sing-a-Long Adventure." "Sauter," a high-diving and trampoline show, and "Victoria Falls High Divers" add exciting entertainment options to the mix. There are loads of dining options at Canada's Wonderland. Guests can try Coasters Drive In, a 50's style diner, or The Marketplace with its all-you-can-eat buffet. Other dining options are scattered throughout the park - from ice cream to hamburgers, and everything in between, guests at Wonderland will never go hungry! Wonderland is open May through October; admission includes both Wonderland and the Splash Works water park. General admission is $44, while Junior/Senior admission is $32. Two-day admission is available at $54 per ticket. For guests who plan repeat visits to Wonderland, a season pass is an affordable option. Regular season passes are $80 each, while Junior/Senior season passes are $65 each.